If you are following Theresa’s Reviews on Facebook, you might have already seen that we did something very unique for our family blog this weekend! We invited everyone into our home for our 2017 Halloween Decor House Tour in a live Facebook video. We shared our crafts, some tasty pumpkin spice snacks, our costumes, and best of all, our Halloween decor. Today, I’m showing some of my favorite parts of our house tour. Also, I’m explaining how you can get ready for the Halloween season with some great products from Cracker Barrel! The night before our Halloween house tour, we stayed up late decorating. One of our favorite parts was trying out our photo booth to make an Instastory inviting everyone to join us! To get ready for our 2017 Halloween Decor House Tour, I knew we needed more than just a few decorations. Luckily, we found plenty of inexpensive items to help make our house festive! 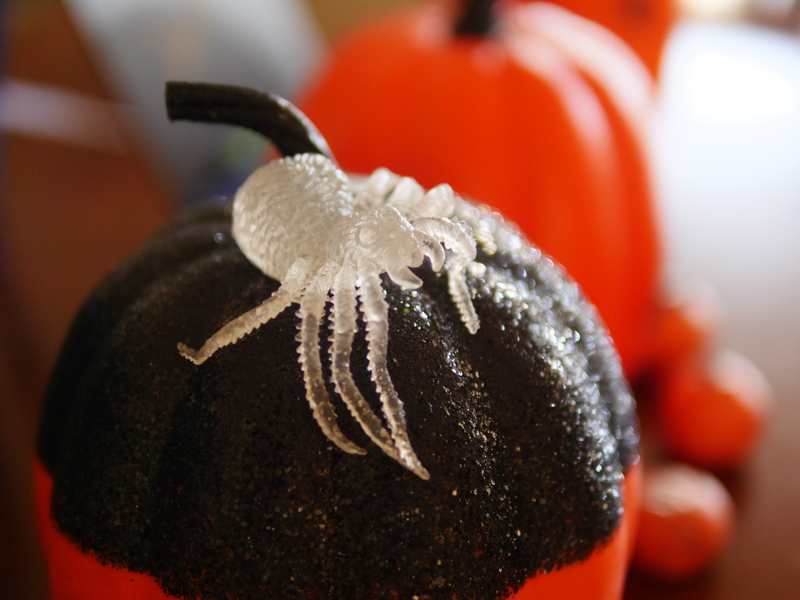 To make the house spooktacular, we bought spider webs, plastic spiders, pumpkins, and fall and Halloween crafts. We also took out some of our old favorites from storage, such as inflatable Yoda and a ceramic pumpkin candy holder. To make your house spooktacular, having lots of little decorations helps. Find some spiders and pumpkins in the dollar section to make your home festive. Cracker Barrel helped us come up with many of the main decorations for our house! 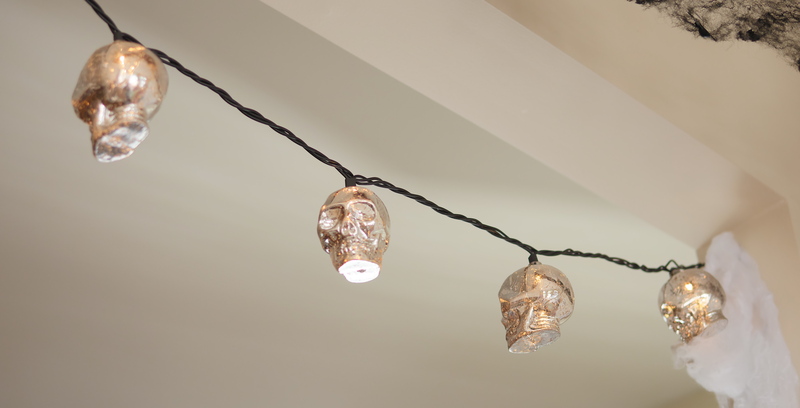 To give our house decor an edgy, modern look, we hung the Decorative Skull String Lights. These are made with a silvery Mercury glass look, and they looked nice against our black and white spider webs. If you want to string these around the entire room, you could buy a few sets. One was just the right size for our interior window between two rooms. These add a nice Halloween accent to your home, while still fitting in nicely with your usual decor. The Decorative Skull Lights look nice hanging on an interior window between rooms. 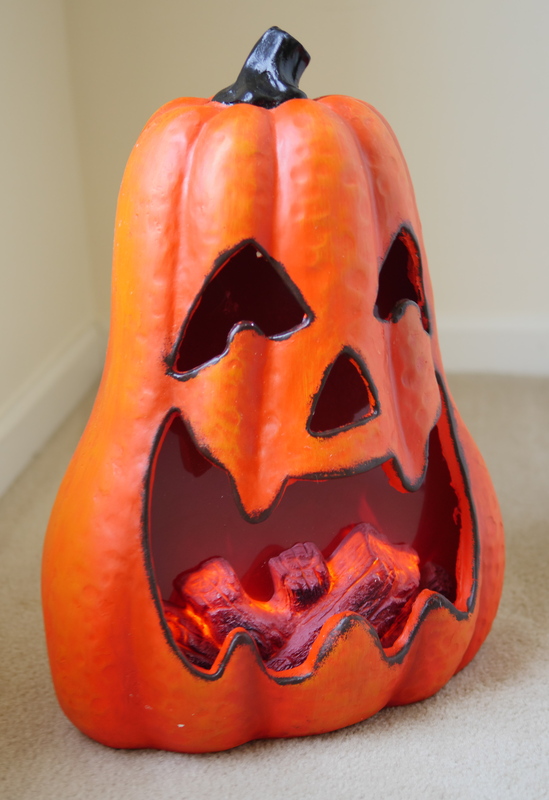 One of our biggest products that Cracker Barrel sent was the Light-Up Pumpkin With Animated Fire Effect. If you’re looking for one main Halloween decor item to display prominently in your home, this one is ideal. With such a nice large size, the pumpkin works great for decorating before you’re ready to pick real pumpkins. At nighttime, the light-up effect looks nice, and since it’s not real fire, it’s a kid-friendly decoration. Cracker Barrel’s Light-Up Pumpkin With Animated Fire Effect is a nice central piece for your Halloween home decor, and it’s safer than the ones with real candles inside. Since we have a family of readers, our favorite decoration was the Animated Spooky Books. With names that include Monster Tales, Mostly Ghostly Legends by Yul B. Skaird, The Big Book of Ghouls, Ghosts, Witches, Vampires, Reapers, Skeletons, Black Cats, Scarecrows, and Monsters by Hal O. Wean, and Trick or Treat by Candy Khorne, this decoration is great for children. When you press the button, the books playfully come to life! 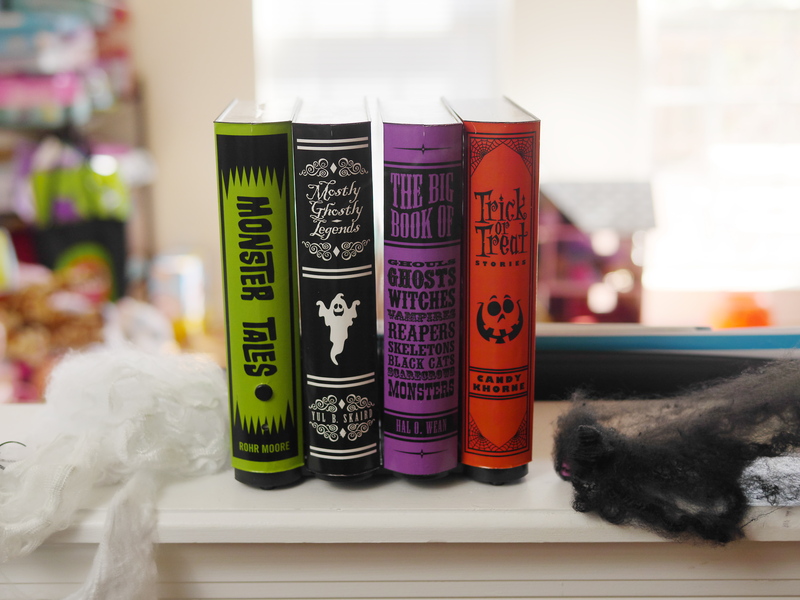 The Animated Spooky Books are a fun, family-friendly Halloween decoration. We also loved the Animated Halloween Snoopy. When you squeeze Snoopy’s hand, the propeller spins and spells out Halloween messages, such as “Trick Or Treat,” and more. Since Snoopy is soft and plush, this decoration is a favorite for children. This decoration also also plays Charlie Brown music. 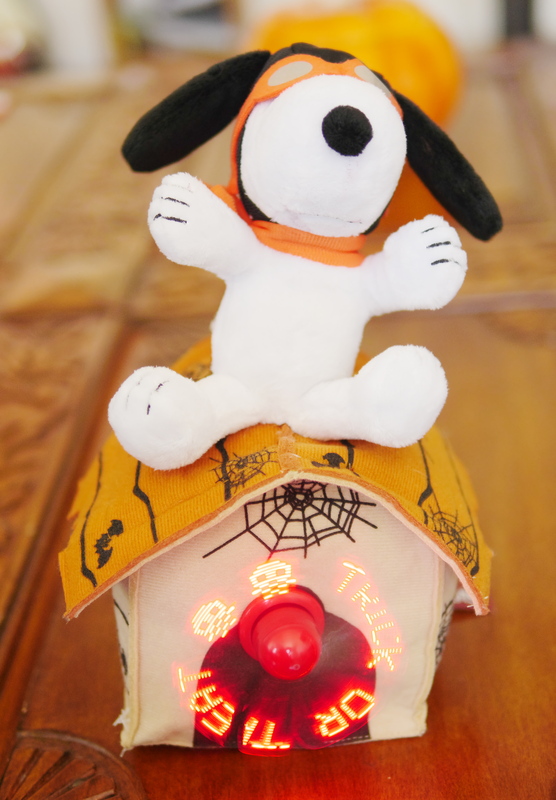 Animated Halloween Snoopy lights up, plays music, and spells out festive Halloween sayings. Perhaps the spookiest decoration we have is the in-store only Decorative Skull Piece. With festive, bright swirling sparkles, this product lights up and would look wonderful outside at night. Plus, this is a great reason to visit your local Cracker Barrel Old Country Store! I’ve always enjoyed going there for a Sunday meal and looking at the fun products in the store. 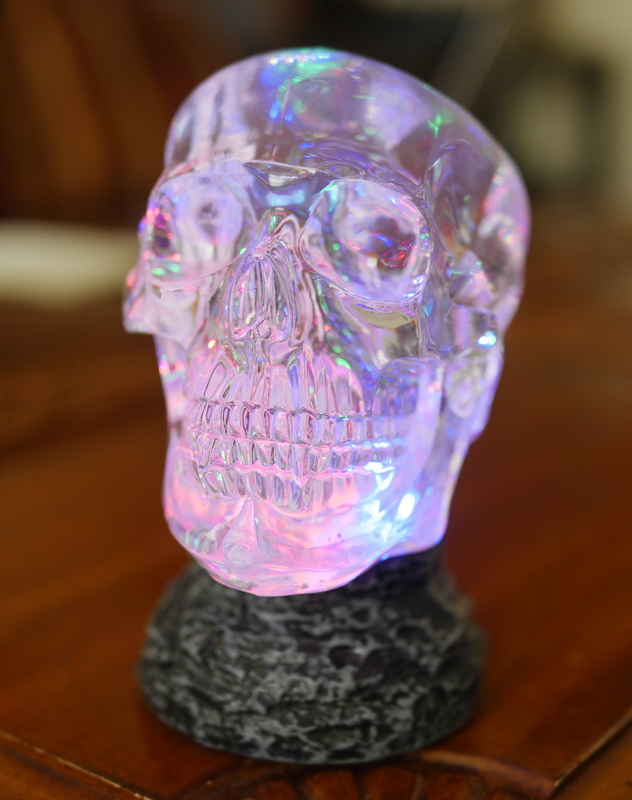 Visit your local Cracker Barrel to spot unique Halloween decor finds, such as this light-up decorative skull piece. When we saw the Animated Enchanted Broom in the Cracker Barrel Old Country store last year, it left quite the impression! When you turn it on, it moves swiftly around the room. Operated with battery power, the broom springs back to life each time someone makes a noise. My children loved saying, “Boo!” and watching the broom zoom by them. 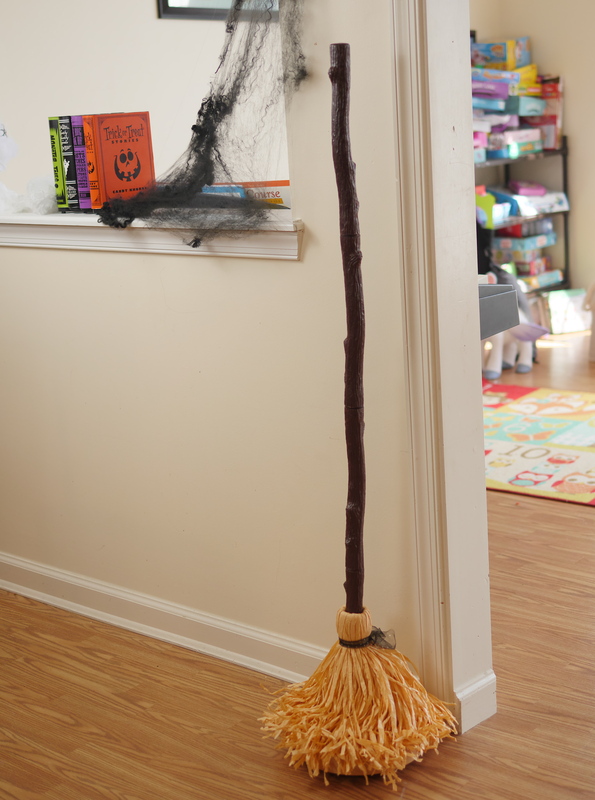 This Halloween, bring your home to life with Animated Enchanted Broom. Thanks to everyone who joined us for our first ever 2017 Halloween Decor House Tour! 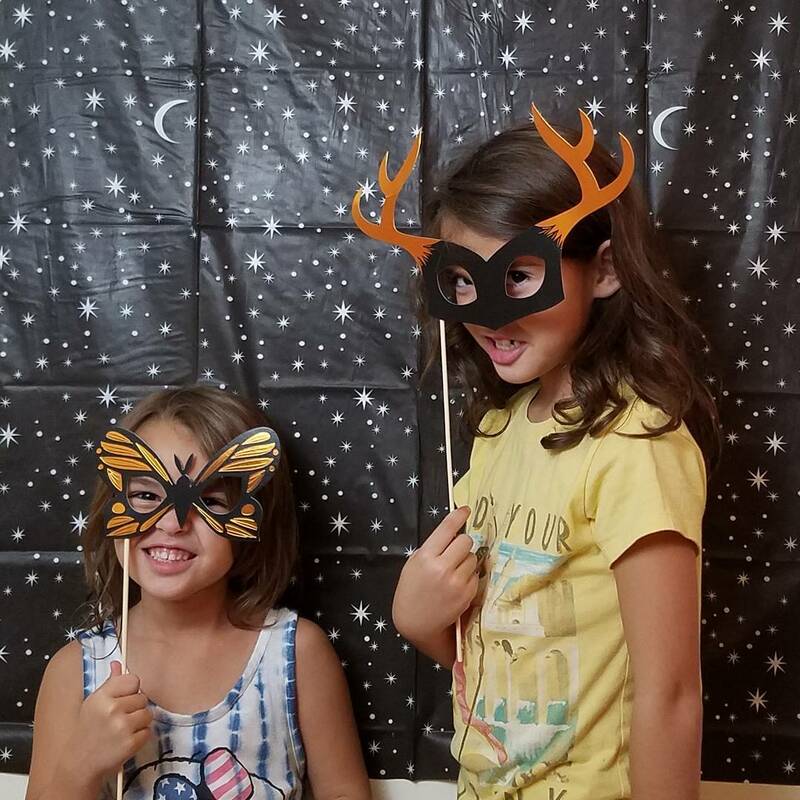 We had such a fun time preparing for this party. From making yummy pumpkin treats to creating Halloween crafts, this was a family activity that we all enjoyed. 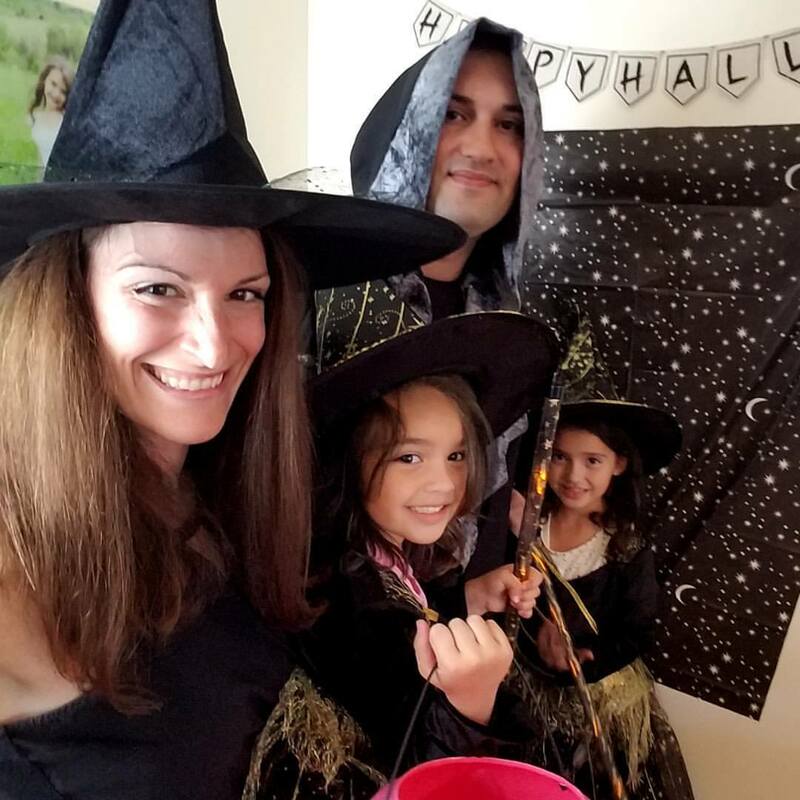 Since my daughter wanted us all to dress up like witches, we all had fun getting into costume for the event. Dressed in witch costumes and holding light-up brooms, the girls had their hair spray painted black. Theresa’s Reviews went live on Facebook for the 2017 Halloween Decor House Tour. If you missed it, you can still find the video on Facebook! Even dad got into costume for the party! Samantha wanted him to be a warlock so we could all dress up with the same theme. So if you see an ominous black hooded figure in the back of our live video, you know who it is. 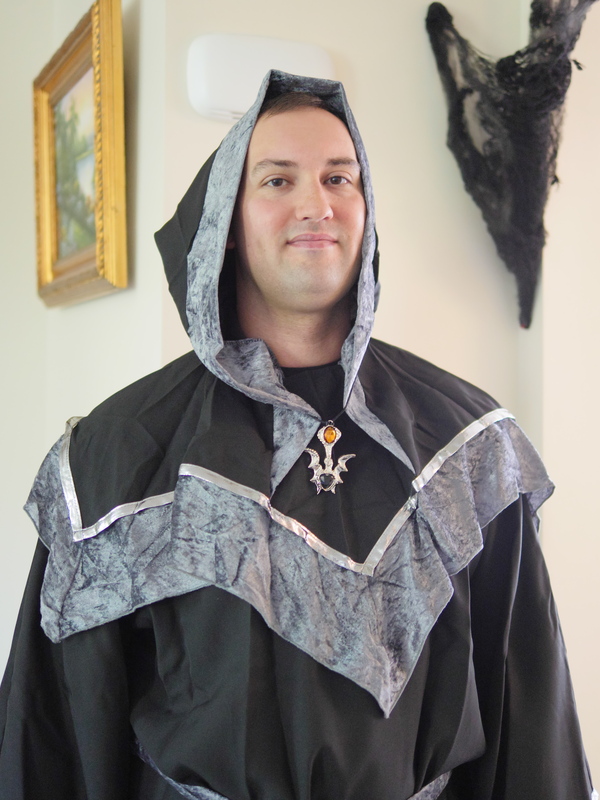 He pretty much wins the best dad award for picking out a warlock costume to bring a smile to his daughter’s faces. One winner will receive a Gold Card, which covers two drinks, two entrees and two desserts at any Cracker Barrel Old Country Store. Watch the 2017 Halloween House Tour video through to the end to find out how to enter! An extra entry will be given to everyone who watched live. Since we saw so many familiar faces, we are going to do a live drawing for the Cracker Barrel gift out of a witch’s hat this upcoming Friday evening to determine the winner! For more celebration tips and ideas, follow Theresa’s Reviews on Facebook, Instagram, Youtube, Pinterest, and Twitter. Disclosure: I received some free products from Cracker Barrel, but it in no way influenced my opinion! The crystal pumpkins are sooo pretty!! Thanks for checking out my article, Christy! Do you mean the pumpkin in the first photo that’s sparkly? I like that one too!